What is Root Canal Treatment and Why it is required ? When you have an infected tooth or badly decayed tooth. Your dentist will repair to save the tooth with a procedure called Root Canal. During this, the nerve and pulp are removed and the inside of tooth is cleaned and sealed. Without treatment, the tissue will become infected and dental abscesses may be formed. Root canal is the term used to describe the natural cavity within the center of the tooth. During RCT, tooth’s nerve is removed. Tooth nerve is not essential for the health and function of tooth, after tooth has emerged. 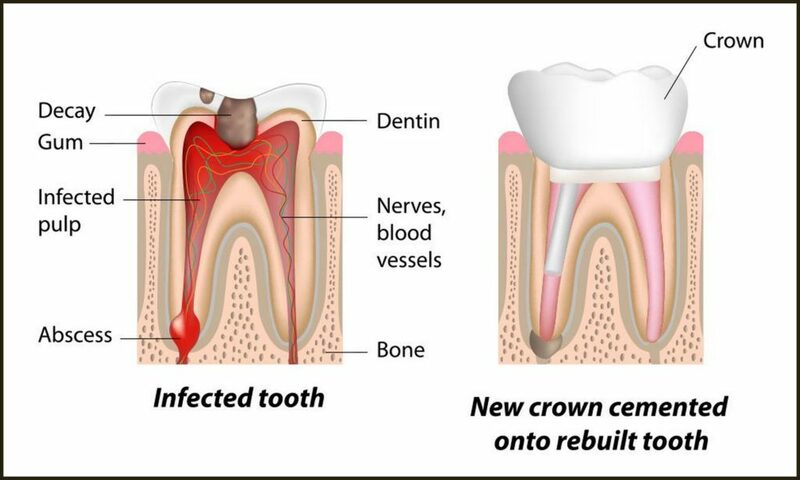 Tooth pulp need to be removed as when tooth nerve gets damaged / infected; the bacteria begin to multiply within the pulp chamber. A dental abscess may be formed if tooth pulp is not removed. Thus spreading the infection to other tooth. Tooth’s Nerve and Pulp could be damaged due to deep decay, cracked or chipped tooth or trauma to the face. First thing your dentist will do when you visit the clinic, is to get an X-Ray to see if tooth are in good shape; or if there are any infected canals that should be repaired. Next, the doctor will make the affected area numb with the help of anaesthesia. It is required to make you relax and comfortable. A hole is drilled into the tooth to make way for cleaning the pulp, decayed tooth debris etc. The debris or bacteria that is collected from infected teeth is flushed away simultaneously using water or sodium hypo chloride. Once the teeth are thoroughly cleaned, they are sealed the same day or sometimes medication is put in affected teeth to remove any infection. Your dentist will determine the sealing timeframe. 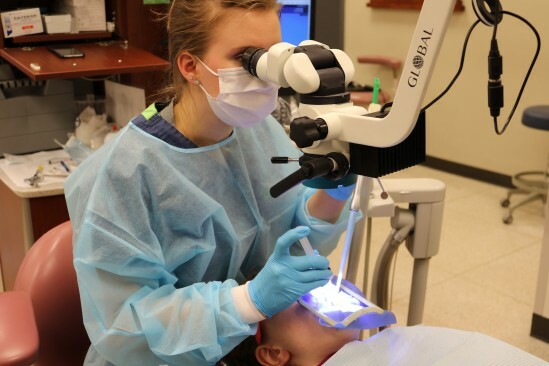 In case, if the tooth is not sealed on the same day, a temporary filling is placed on exterior hole of drilled teeth to prevent food and other contaminants to enter the cleaned tooth. Further a crown may be place on RCT tooth to make them fit for daily use. Your dentist will discuss with you about any other dental work. Root canal treatment is not a painful procedure, but sometimes you may experience negligible pain during fillings. At Sowmya Dental Clinic, we make sure that your root canal treatment is less painful process. At Sowmya Dental Clinic, we have perfect equipment to complete root canal treatment in single visit. Our clinic is equipped with Endogear, which will help us finish your root canal treatment in single sitting. We are probably only dental clinic in Guntur, to use Endogear equipment for RCT. We practice best and modern dental treatment procedures to make sure that your time is saved. Comfortable treatment procedures help you get complete care with our dental specialist.